Formed 13 Jul 1943 in Constanza from Stab/Aufkl.Gr.125 (See). In Aug 1944 absorbed Stab/Seefliegerführer Schwarzes Meer. 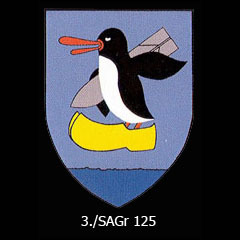 On 5 Sep 1944 disbanded and was used to form Stab IV./ZG26. Formed 13 Jul 1943 in Sevastopol. Disbanded 5 Sep 1944. Formed 13 Jul 1943 in Süda Bay from 2./Aufkl.Gr.125 (See). In Dec 1943 redesignated 4./SAGr.126. Reformed Dec 1943 in Sevastopol. Disbanded 1 Jun 1944. Formed 13 Jul 1943 in Varna from 3./Aufkl.Gr.125 (See). Disbanded 5 Sep 1944. * Sevastopol was used as a forward base.